When you mix Swedish attention to detail and French flair, what would you expect as the result? A closer look at the latest Ron Dorff collection and it becomes clear and obvious. Founded by Frenchman Jérôme Touron and Swede Claus Lindorff, Ron Dorff is a brand which, for us here at Short Motivation, has been somewhat under the radar, despite a London store (which is now on our ‘to do’ list for our next trip to the city). Recently, we decided to take a closer look and the new S/S 18 collection has caught our eye. The brand is a playful take on high-quality sports and leisurewear. The Swedish element means you can expect hard-wearing, well-designed and functional clothing, made in Portugal. The French aspect adds fun – mottos on the sweatshirts, but for S/S 18, a touch of fluorescent, which takes its cue from 80s sportswear, but with a modern design twist and keeping the “Discipline is Not a Dirty Word” mantra. We wondered what was the reasoning behind starting the brand and Lindorff added “the idea was to offer everything a man needs before, during and after sports and to cater to an active urban man who doesn’t necessarily want to dress like a 17-year-old skateboarder, nor like his father”. The Ron Dorff collection as a whole is surprisingly large, consisting of sportswear, underwear, swimwear and accessories. There’s even a skincare collection produced in association with Face Stockholm. Although mostly menswear, there are a few pieces for the ladies in S/S 18, such as motto sweats and classic tennis shorts. Part of the wider ‘Side Lines’ collection, which have bright red straps down the side of each piece, this is one of the standout items. 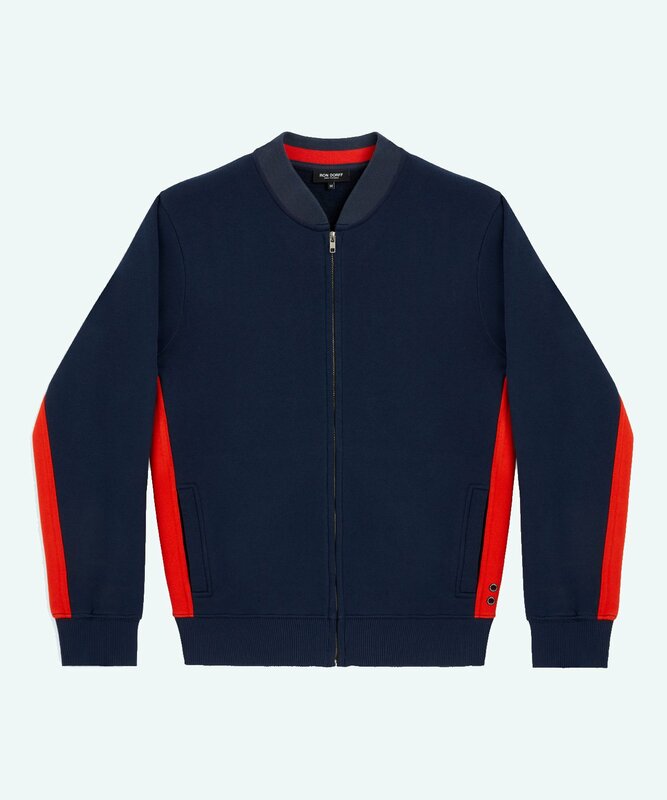 Based on the design of the tennis jackets from the 70s, Ron Dorff has given this a modern update, using a brushed cotton fleece (and 20% polyescester to give the jacket a guaranteed fit once washed) and tapered design. This navy jacket looks especially good contrasted against the Ron Dorff black Exerciser Shorts. Do you want to make a statement? 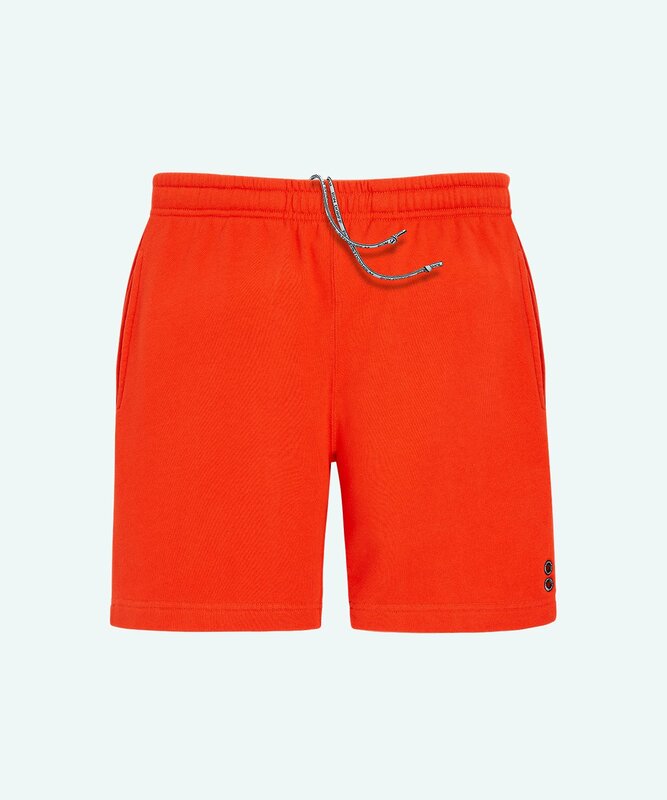 This Shock Orange pair of jogging shorts will certainly gain some attention. 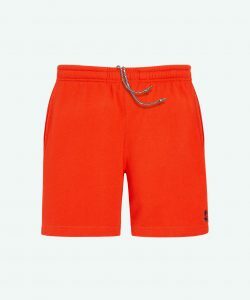 Made from 80% American loopback cotton, with a slightly tailored fit, these longer length shorts are ideal for the gym or just a lazy Sunday afternoon. Mix it with a light grey Ron Dorff sweat top. Subtle design additions include signature eyelets and zipped back pocket. Sometimes simple is best and we love both the design and colour of this t-shirt in Light Khaki. 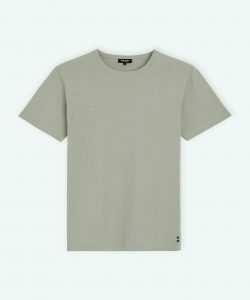 This crew neck t-shirt is made from 150gr of the finest jersey cotton, with a slightly tapered fit. Details include double black-lacquered eyelets on the side of the shirt. 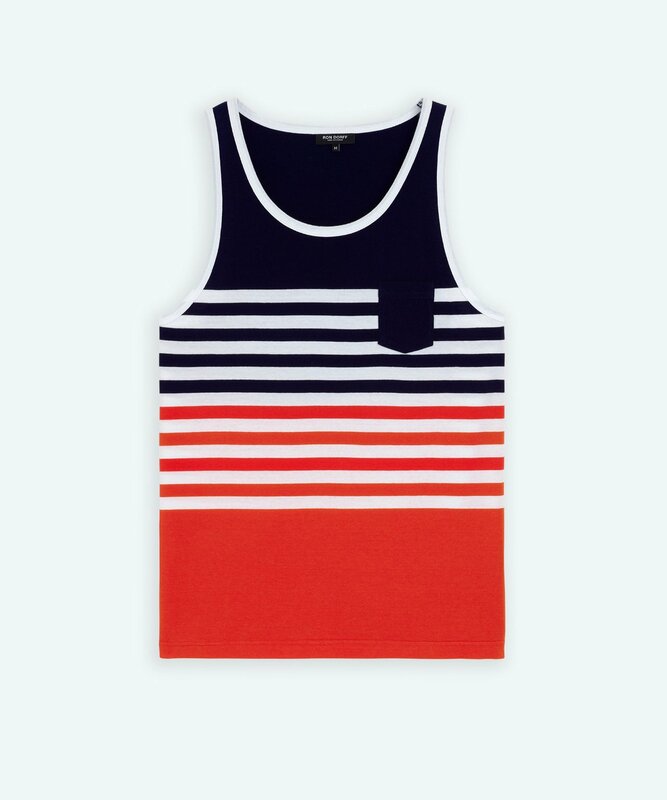 A tank top is both a gym essential and ideal on a hot summer’s day. Mix it up with a pair of light shorts to keep cool. 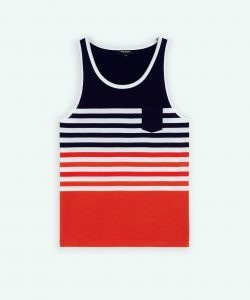 Although we’re also keen on the ‘Disciplined’ range of tank tops, we have our eye on this particular top from S/S18. Pre-washed in the finest 100% jersey cotton, with a slightly tapered fit, we love the contrast between the stripes on this particular top. Frankly, the Ron Dorff S/S 18 collection is one of the biggest launches so far and we’re impressed. 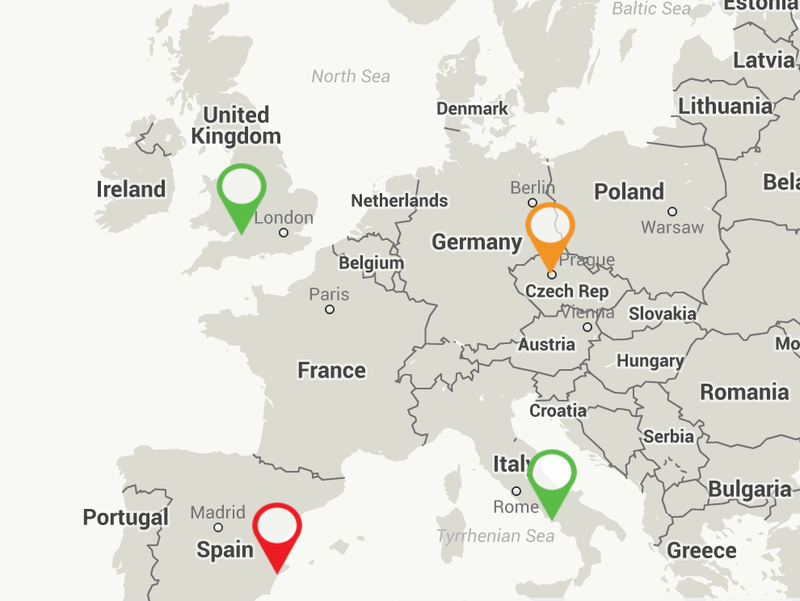 We’ve only touched the surface with our four key pieces and some are yet to hit their website. For more information, head to the Ron Dorff website.